French actress, dancer and singer Liliane Montevecchi is appearing once again at The Crazy Coqs with her show telling the story of her life from her days as a Prima Ballerina to Hollywood and Broadway. Beginning in Roland Petit’s Ballets de Paris, Montevecchi went on to a film career in Hollywood and later The Folies Bergère, though she never appeared naked. She “had too much talent for that!”, she asserts. But, she is perhaps best known now for her roles in Grand Hotel, for which she was nominated Best Actress in a Musical , and Tommy Tune’s Nine, garnering her Tony and Drama Desk Awards . Now 83, Ms. Montevecchi remains as slim, feline and, truthfully, nearly as lithe as in her younger days. With enormous presence, she slinks on to the stage gesturing with hands and long fingers she employs like delicate, expressive instruments. At one point, she does a ballet barre lifting her leg high on to the piano, and does a full port de bras (long low bow to the floor). Although she did a dance routine with Fred Astaire (sadly cut from the film) and had fun going duck hunting with Clarke Gable, Ms. Montevecchi did not really enjoy making films, preferring the immediate contact with an audience – so, she is ideally suited to the intimacy of cabaret. She had the privilege of knowing legendary French cabaret artists, such as Josephine Baker, Édith Piaf and Mistinguett (a cutlery thief, apparently! ), and pays homage to them with a medley of their songs. The first set of the show also includes some standout material, namely the saucy I Never Do Anything Twice, a sensitively sung Les Feuilles Mortes and a rarely heard Cole Porter song Si Vous Aimez Les Poitrines. Her deep-throated husky voice with French accent still beguiles her audience as much as her feline fascinating movement. Slithering through the audience singing Je Cherche Un Millionaire, she later invites a man to join her on stage to dance in Newfangled Tango. Whilst her self-deprecating wit and comic timing are impeccable, I found her ballads the most mesmerising, notably Boulevard of Broken Dreams and Irma La Douce (which she played on Broadway). Ably accompanied by Nathan Martin, musically, her medleys work well as story-telling devices, flowing seamlessly and hardly appearing to be medleys at all. Ms. Montevecchi went on to describe the extraordinary good fortune she had to win her most recent roles on Broadway, her singular audition, and concluded the evening with Bonjour Amour from Grand Hotel and Follies Bergere from Nine. A star not to be missed. Natalie Douglas is appearing in London once more at the Crazy Coqs with a new show written especially for the occasion. Together with her Musical Director Mark Hartman, of Broadway’s Avenue Q & Sondheim on Sondheim, have created a program of song honouring the extraordinary talents of Sammy Davis, Jr., Nat “King” Cole, Stevie Wonder & Joe Williams. Opening with a sultry version of For Once In my Life, she sets the tone for the evening – subtle, from the heart and sophisticated. We are treated to works from amongst others Billy Strayhorn, Stevie Wonder, and Irving Gordon, sprinkled with histories of the songs themselves, Natalie’s personal relationship to them and how her parents’ eclectic tastes shaped her knowledge and appreciation of this collection. I have written several times about Natalie Douglas, and each show she does is exemplary, not only of the particular genre or artist she is paying tribute to, but in terms of artistry. She has the voice to raise the roof off any venue, but this is never used gratuitously or simply to display her prowess. There is always a narrative or artistic choice behind its employment. This show is no exception. One example is her rendition of Mr Bojangles. Understated for the most part, and all the more powerful for it, one could feel the collective emotion of the audience welling up. Natalie is from a political family, is comfortable with the topic without bombast, always with a dash of humour, and helps the contemporary audience appreciate the role a particular song may have played in American history. Searingly, she used Stevie Wonder’s You Haven’t Done Nothin’ – his attack on Nixon and Watergate – to make her own commentary on Donald Trump and the current election. Interestingly, two songs that she treated us to, Gonna Build a Mountain and Once in a Lifetime came from British artists Leslie Bicusse and Anthony Newley. Bricusse is an English composer, lyricist, and playwright, most prominently working in musicals and film theme songs, and Newley was the English actor, singer and songwriter he very often collaborated with, most notably on Stop the World, I Want to Get Off. She saved the best till last, however. Ol Man River was her encore, with sublime accompaniment by Mark Hartman, and brought the house down. Tom Carradine launched his first album of his Cockney Sing-A-Long at the wholly appropriate setting of Wilton’s Music Hall, one of the few Victorian Music Halls left standing in London. The album, recorded at the Bull and Gate in Kentish Town, is attractively produced, with an accompanying booklet of words, featuring the songs in his repertoire, a selection of which are performed in his shows. Wax mustachioed and suitably dressed, Carradine took his place at the piano amid great cheers from what transpires to be a regular, dedicated and growing following of quite a diverse age range. Starting straight into the sing-along, with little introduction, Carradine really gets the atmosphere going. The evening features songs from Music Hall, Wartime, West End and some pop songs from various decades. The second half also includes ‘guest medleys’ of various themes, which change from show to show. Tonight featured a sitcom medley which included the Dad’s Army song , One Foot in the Grave, and Only Fools and Horses; and also a medley of love songs (Valentine’s Day is just around the corner) and songs from ‘Cockney’ musicals such as Oliver and My Fair Lady. He explains that apart from song and the ‘joanna’, there are 3 main elements to a cockney sing-along – a) drink – the bar is open throughout, b) dancing – there is room at the sides and in the balcony for a knees up, and c) interjection – which he provides with gusto. The audience need no encouragement to join in, not only singing, but gesturing, getting up on their feet, the lot. During the Wartime section, Union Jack bunting is produced and hung around the hall. The group of elderly people beside me were among the most active, but the younger audience in the rows in front were smiling and singing with enthusiasm also. This is very much a family affair, with some dressed in old cockney outfits for the occasion. As well as an accomplished musician, Carradine is a good showman with a charming personality and very nice singing voice. The audience clearly love what he does. Wilton’s is beautifully restored, maintaining a somewhat ‘ruined’ feel – not too polished or glitzy, very atmospheric and keeping the rough- hewn walls. The twisted pillars are particularly noteworthy. The stage is tiered and the words for the sing-along are projected on slides onto the back wall between the red velvet curtains. This is ultimately a very simple idea – just a lot of people round a piano led by the musician – an extension of a family get-together. It has possibilities of growing, not only in terms of larger audience numbers in bigger venues, but artistically. Personally, I would like to see it enhanced by adding guest performers, interspersed with stories, and perhaps histories of the songs themselves. It is refreshing to think that in this day and age of digital, instantaneous and over-produced everything, there is still a market for such an old-fashioned concept as a sing-along and knees-up. And well done to Tom Carradine for making it happen, especially in such a perfect venue for it. Known for his solo shows of Noel Coward and Flanders & Swann, Stefan Bednarczyk is back at The Crazy Coqs performing his new show, “BEYOND A JOKE”. He says he now focuses on ‘the rest of his education’, and some of the other influences on his development during his early teens, many of whom had records “Humour” section of his local record shop in the 1970’s. Opening with a nice unexpected take on Second Hand Rose, the tone of surprise and wit is set for the evening. Apparently, Tom Lehrer had a theory that folk songs were particularly atrocious because they were written by the people, and had they been written by professional songwriters, they would have had far more merit. Bednarczyk goes on to display his versatility in taking the song My Darling Clementine to render each verse in the styles of Cole Porter, Mozart, jazz and Gilbert &Sullivan. Gershwin’s music is featured, but the evening is largely given over to Allan Sherman, the political parodies of Tom Lehrer, whose songs are almost shockingly relevant today, even though many were written in the 1950’s and ‘60’s, and the keenly observed social commentary of the far less renowned Jake Thackeray. Thackeray was a Yorkshireman, with a humour as black and dry as dust, whose cannon deserves to be much better known. As Bednarczyk himself says, the narratives run like a one-act play, the lyrics of which are quite often somewhat rude e.g. Beware the Bull and the sardonic yet tender Lah-Di-Dah. For Lehrer lovers, we were treated to his Masochism Tango, Vatican Rag written in response to Vatican ll) and the wonderfully witty Oedipus Rex. There were also songs from Alan Plater’s Close the Coal House Door, composed by Alex Glasgow aka the Bard of Tyneside. This part included one of my favourites of the night, As Soon As This Pub Closes. Bednarczyk would be the first to admit his voice, whilst enjoyable and flexible, is not the strongest in the business, and he confessed to feeling a little ‘second nighty’ the evening I saw him, but his performances are always highly engaging and a lesson in lyric delivery – sharp, pinpointed with crisp articulation with a light or biting touch, as the situation demands. And all with immensely skillful, atmospheric and at times virtuoso self-accompaniment on the piano. If these vicious lyrics were his early influences, he must indeed be a bit twisted! A delight, as ever. St James Theatre has staged a sensitive and powerful production of a show that might potentially have been a risk for the main house – a one-woman show featuring not an actress or singer, but a concert pianist with a story to tell – but what a story. Mona Golabek presents the extraordinary life of her mother Lisa Jura from the age of 14 in 1930’s Vienna, through the turbulent years of World War 11. An entrancing story of a series of goodbye’s, sacrifice and disappointments, love, and danger, set to the music that kept Lisa going through that tense and destructive war. The stage is set simply and strikingly with a grand piano, a couple of steps for layering and all framed in a gilt picture frame containing 3 smaller frames, through which appear paintings, photographs or moving newsreel footage from the time. After introducing herself, Golabek steps to the piano, and whilst playing narrates the story as her mother,with the occasional characterisation of other people who come into her life. Lisa, like her own daughter, is also the daughter of a concert pianist mother and a Jewish tailor in Vienna in the 1920s, a time of elegant café society and when classical music was much elevated. Taught by her mother and a wonderful teacher in the music school, Lisa is herself an exceptionally gifted young pianist, and dreams of making her concert debut at the Vienna Musikverein. But, as she reaches her 14th birthday in 1938, the Friday lesson she lives for is aborted. After Lisa is grudgingly allowed access by the German soldier with the rifle at the front door, her much beloved instructor tells her it is now forbidden for him to teach Jewish students, and that it is simply too dangerous for them to continue. He confirms her rare gift and bids her goodbye. Her father turns to gambling after his business suffers, and after a terrifying encounter with Nazi thugs on the night of riots, he presents his winnings – a single ticket on the Kindertransport, a program to relocate Jewish children to the relative safety of England. The family has three daughters, yet only one can go. The family chooses Lisa, with her mother imploring her to keep playing the piano, assuring her that she will be with her with every note. What follows is a tale of kindness, struggle and huge uncertainty for the young girl, in a well-evoked wartime London where she is placed with a family running a hostel overcrowded with other children from the Kinder trains. Lisa struggles to maintain contact, but eventually loses touch with her family in Europe, and yet is able to continue playing and keeps alive her dream of making her concert debut with Grieg’s Piano Concerto in A Minor. As her mother had taught her, “Every piece of music tells a story”, and each gloriously played rendition in this piece does the same. The music featuring works from Beethoven, Debussy and Chopin, both passionately and delicately played by Golabeck, is more than simply illustrative. Director Hershey Felder, who adapted Golabek’s book for stage, employs Grieg’s concerto to guide the piece from beginning to end, each movement setting scenes in her life from the tensions in Vienna, the terrors of the Blitz and finally, her moment of bitter-sweet triumph. The classical repertoire of a student of the time, together with popular pieces of the day e.g. These Foolish Things shape the show as a whole and bring to life certain scenes, such as the swanky club for soldiers she gets a job in, where romance is in the air, and the repetitive, loud conditions of the sewing factory where she initially earns her keep. Golabeck, not being an actress, tells the story simply and unaffectedly, and with such personal investment, is all the more powerful for that. It is also particularly moving to see her as the embodiment of the next generation of daughters taught to play so wonderfully by their mothers before them. There was not one person in the audience not affected and stunned by this gloriously played and beautifully produced piece. Award-winning American composer and lyricist John Bucchino is not as well-known here as some songwriters who have journeyed to play in London, but his work is much beloved by the cabaret cognoscenti. He has written for both Broadway and film, and his compositions have been performed by pop, theatre and opera artists such as Art Garfunkel, Kristin Chenoweth and Yo-Yo Ma. Much of his material gets aired, though, on the concert and cabaret circuit – and for good reason. His songs often tell a whole story, are complex and rich, rather than glitzy, and are for the most part melodic with only selective moments of discord included for specific effect. Such fare is a gift for the cabaret singer. Tonight, however, is a departure from his own compositions. Indeed, it is a departure from songs altogether – this is a solo piano show, and a very surprising one. Between May 12th and May 30th 2003, during a series of eight recording sessions, Bucchino played (and, as he says, ‘played with’) the songs of Richard Rodgers on that great Broadway composer’s own piano, currently owned by Rodger’s grandson Adam Guettel, who has it in his New York flat. Bucchino does not read music. He plays entirely ‘by ear and by instinct’, so his final arrangements of Rodgers’ work have not been written down, but were recorded as he played them, and what he considered the best of them appeared on his album On Richard Rodgers’ Piano (voted Best Instrumental CD by Show Business Weekly). Bucchino played simply ‘whatever popped into my fingers’, as the spirit (probably residing in that seasoned piano) moved him. Such was the success of that extraordinary venture, he decided to follow the same procedure with the music of The Beatles, culminating in a new album BEATLES Reimagined. The evening presented at Crazy Coqs is the second performance of a selection from both those albums, together with anecdotes about the songs’ history and insights into his pianistic process. These anecdotes are by no means dry or academic, but are delivered with humour and enthusiasm, and give helpful pointers for us to listen out for, such as he likes to use his right hand to play counterpoint as well as melody, most especially in the music of Rodgers. The arrangements are inventive, engaging and exceptionally beautiful. The programme itself is well-balanced with a good mix of ballads and up-tempo. Most of the songs he plays are very familiar to the audience, but although we have never heard them played like this, none are rendered so outré, that the audience gets lost or feels alienated, as I have seen in far too many jazz performances. Musically intricate and fascinating, the songs are rendered resonant and recognisable, with lush and sensuous playing, making each a fresh delight. Each item is improvised on the spot, albeit that certain shapes may be emerging predictably for Bucchino himself, so that standout numbers of any one night may play out very differently on another occasion. However, the ones that struck me were The Beatles’ Norwegian Wood, with a delicate start leading to an encompassing crescendo, and then fading with a surprise ending; a yearning version of While My Guitar Gently Weeps; the haunting Fool on the Hill; and a beautiful treatment of Rodgers and Hammerstein’s If I Loved You from Carousel. He explained that his mother listened to the album of that musical many times whilst pregnant with him, so he is indeed deeply steeped in the Rodgers work. Bucchino tends to favour atmospheric and melancholic songs, it seems, almost as though he is working something through in his mind, often leading to an intense climax and then resolving. The extra decorative notes lead the listener, each contributing to the drama or musical narrative, rather than simply show off his prowess or provide gymnastics. There is nothing gratuitous here. His patter is charming with amusing stories, such as his encounter with Billy Joel, which help us feel we know him better, and as he pointed out, this was a huge exercise in trust, both in his own musical instincts and that his muse would not let him down in public, and also in the audience’s willingness and ability to remain attentive, given this is a purely improvised instrumental evening. Apart from his encore, which was genuinely unplanned, the evening was ended with a reflective, quiet arrangement of McCartney’s Blackbird, rather than a stomping rousing finish – an appropriate choice for the programme presented. This was a very unusual, quite unexpected and truly delightful show. I can honestly say I have never enjoyed an instrumental evening more. Creativity abounds in Lucy Bailey’s brilliantly inventive production as hands deliver props from out of trap-doors in the floor, sheets are flapped for sales or elephant’s ears and an electric fan is employed for a blizzard. Presented on a rough-hewn set, random items such as bicycle wheels are amongst the studied inventiveness of Anna Fleischle’s design. There are many similarities between this and another highly physical adaptation, The 39 Steps, still enjoying a lengthy West End run. 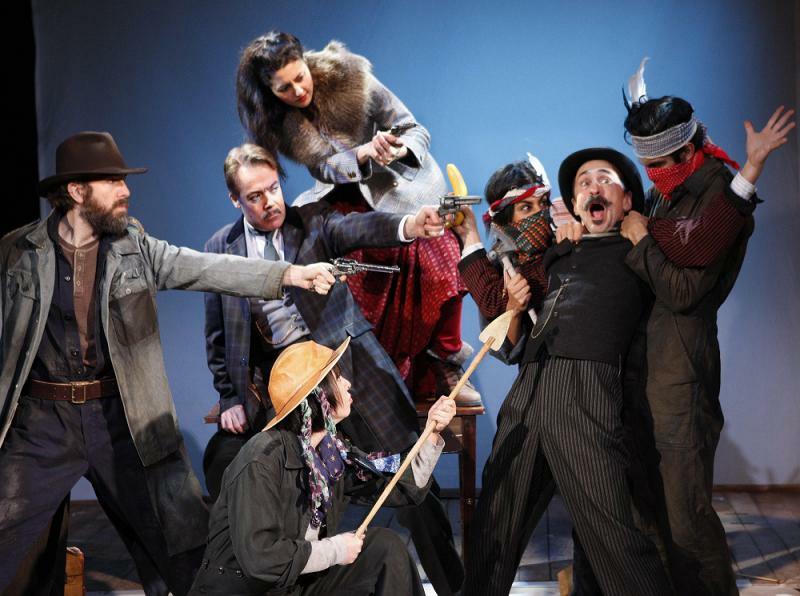 Both panoramic tales have as their hero an incorruptible square-jawed Englishman, and as Phileas Fogg, Robert Portal is the epitome of unflappable Empire sangfroid. 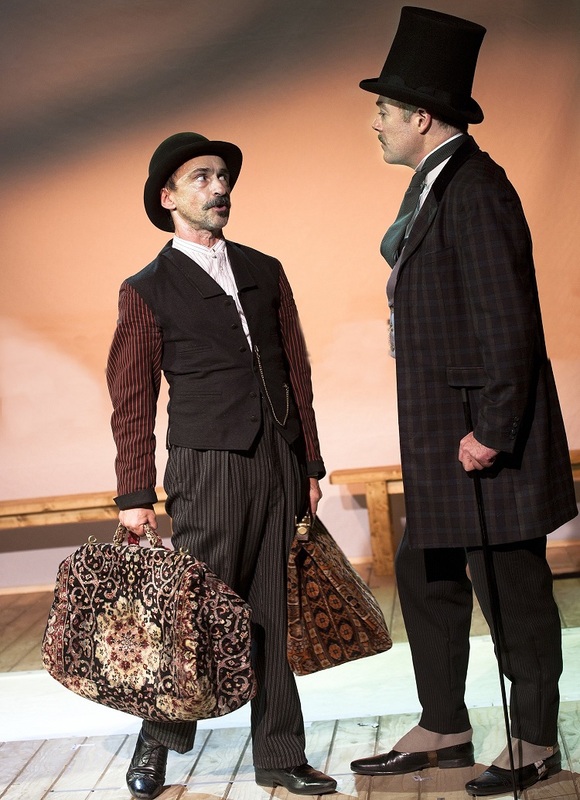 Interestingly, the actor has also appeared in the aforementioned 39 Steps, as has his sidekick, Simon Gregor, who plays his valet Passepartout with assured physicality. The cast of 8 work tirelessly to populate the stage with bustling crowds from around the world and there are other notable individual performances. Tim Steed is master of the instant vignette while Tony Gardner as Inspector Fix who trails Fogg on his globetrotting journey, nearly steals the show as he delivers yet another asinine policeman remark, and his fisticuffs scene with Passepartout was particularly well executed under the movement direction of Lizzie Gee . There is a touching love story at the heart of this tale and Shanaya Rafaat as Mrs Aouda is a charming and strong heroine, just as capable of hauling on a rope in an emergency as encouraging the emotionally myopic Phileas to appreciate the beauty of his surroundings. It is perhaps Phileas’s emotional journey which is insufficiently charted, and dramatically, we need to see this develop if the show is to make any visceral impact. In many ways though, this is a first class family frolic and writer Laura Eason has ensured that any vital exposition is inserted in all the right places while still sounding natural and unforced.